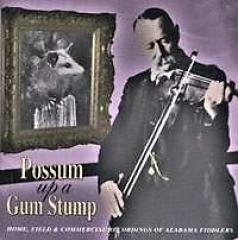 In 1988, the LP album "Possum up a Gum Stump: Home, Field and Commercial Recordings of Alabama Fiddlers" was released. Produced by the Brierfield Ironworks Park Foundation with additional funding from the National Endowment for the Arts and the Alabama State Council on the Arts, the album was a collection of songs performed by 19th and 20th Century fiddle players throughout Alabama. This collection consists of the 24 reel tapes of the Cauthens' fieldwork that was used to compile some of the recordings on the album. Side 1 of the album contained old songs obtained from vintage recordings made between 1924 and 1949. Side 2 contained recordings of contemporary fiddle players made for the album by Joyce and Jim Cauthen in 1986 and 1987. The recordings by the Cauthens were made in various locations in Alabama using equipment on loan from the American Folklife Center of the Library of Congress. The tapes include fiddlers who were featured on the album as well as other musicians who were not included. The fiddlers featured on the album were Jess Moore, Noah Lacy, Leonard Keith, Matthew Hill, Howard Colburn, Howard Hamil, Monte Sano Crowder, and Ralph Whited. Original recordings restricted. Field notes and tape log unrestricted. "Possum up a Gum Stump" field recordings, LPR235, Alabama Dept. of Archives and History.